New images of Sherin Mathews have been released on a public page on Facebook. Houston: Police in Richardson, Texas, are still holding out hope for a three-year-old Indian girl who mysteriously disappeared 10 days ago after her foster father left her in an alley at 3 am for not drinking her milk. 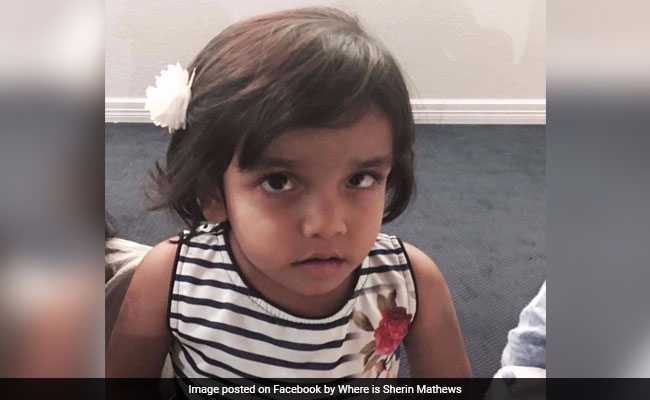 Sherin Mathews vanished on October 7 after her adoptive father Wesley Mathews told police he left her outside their home at 3 am as punishment for not drinking her milk. Mathews claimed that when he went to check on her around 3:15 am Sherin was gone. Police in Richardson said he waited five hours before reporting Sherin missing. He reportedly told police that the alleyway where he left Sherin is frequented by coyotes. In their latest Facebook post, the Richardson Police Department said it appreciated the messages of support and the efforts of the community in resolving the case. "We continue to investigate the disappearance from 10/7/17. Detectives are working through the video surveillance collected...," the statement said. "The process of reviewing evidence both digital and physical, as well as witness statements is a time consuming process and we ask for patience as we make progress," it said. Police also appealed to the public to contact them if they have any information relating to this case. Meanwhile, new images of Sherin have been released by acquaintances of the family on a public page on Facebook. One video shows Sherin singing happy birthday. Another video shows her playing at church. After the girl's parents stopped cooperating with police, investigators said they are working on a lead: someone left the Richardson home in the family's sports utility vehicle (SUV) the morning of her disappearance, local news channel KTRK reported. Investigators are looking for possible surveillance footage of the maroon Acura SUV leaving the home of Sherin, as they try to determine who was driving it.